Google Play Music is a streaming app and music player that features over 35 million songs, which is impressive compared to a lot of other music streaming apps out there. A paid monthly subscription not only gets you complete access to the entire portfolio, but you can also take advantage of a YouTube Red membership along with it. Of course, if you aren’t looking for a streaming service, the Play Music app is a solid music player as well, for you to enjoy any music that you have stored on your device. If you are looking for a music player and streaming service combo, the Google Play Music app is a great choice. However, as is often the case with a lot of apps that are available, Google Play Music is not without its issues. To help you out, we’ve rounded up some of the common problems faced by Play Music users, and offer potential solutions and workarounds to address them. Disclaimer: Not every user will come across these issues, particularly if you make sure to keep the app updated regularly. A lot of users have come across duplicate tracks that have been saved to their Google Play Music, particularly when they have synced their music from iTunes. Unfortunately, the Play Music app doesn’t have a way to identify and delete duplicate tracks, so the only workaround is to delete the entire collection and re-upload it. Make sure that doubles aren’t already present in the library, and then re-upload it. There is a workaround available that was created by a Reddit user, and you can find the step-by-step guide here. Keep in mind that technical know-how is definitely recommended if you are planing to follow this route. You may have come across error messages stating that the payment has been declined, cannot be processed, or that the card is “not eligible,” either when setting up the subscription for the first time and when renewing it. You can try standard steps like removing and re-adding the payment method of Google Payments, make sure the card information is correct, or try another payment method. If you are card is getting declined in the Play Store but working everywhere else, you may need to contact your bank or Google to find out what the issue is. For a lot of users, restarting the app and Play Store seems to have worked. First go to Applications (or Apps or Application Manager, depending on the device) in the Settings menu and scroll down to Google Play Store. Then tap on “Force Stop.” Then tap on “Storage” and tap on “Clear Cache” and then “Clear Data.” On some devices, you may find the latter in the “Storage and USB” section the Settings menu. Open the Google Play Store after these steps and try the payment again. Some users have found that tracks that have been downloaded on the web player don’t show up on their smartphones. There is a simple workaround to fix this. In the Settings menu, go to Apps or Application Manager, search for Google Play Music. Then tap on “Storage” and then press “Clear Cache.” On some devices, you may find this under the “Storage and USB” section in the Settings menu. Restart the device, then open the Play Music app and all your music should now be available. You may have come across some issues with uploading songs to the Music Manager from your own collection. First, make sure that the audio you are trying to upload is of a supported format. Supported formats include MP3, AAC (.m4a), WMA, FLAC, OGG, ALAC (.m4a), and DRM protected AAC (.m4p). Some music file types like WAV are not supported. If songs aren’t uploading, make sure that the library isn’t full. Currently, you can upload up to 50,000 songs to your library. If you have gone past that, your only option will be to delete some other tracks to make room for new ones. Some users get an error message asking them to log in to Google Chrome when using the web-based Music Manager, even if they are already logged in. Simply logging out and logging back in to Chrome seems to do the trick here. Many users have found that downloaded stations are no longer playing when the device is in “play downloaded music only” mode. Downloaded playlists and songs seem to play as expected though. This is one of the Google Play Music problems that affected users a couple of years ago, but seems to have made an unfortunate return now. Make sure you don’t have the “stream only on Wi-Fi” turned on and enable streaming over mobile data. Even though the point of downloaded stations is to play music offline, even having this feature enabled seems to stop downloaded stations from playing if not on Wi-Fi. You can also turn on the option again once the station you have downloaded starts playing. Reporting this issue helped the last time around, so make sure that you submit a bug report. A future update should hopefully resolve this problem once again. Many users have found that they cannot log in to the Music Manager because they have 2-factor authentication enabled for their Google account. The prompt that is supposed to appear on your phone does not. When going through the 2-factor authentication process when trying to log in, select “try another way to log in.” You can now use either the “get a text message with a verification code” or “get a verification code from the Google authenticator app” options. Both seem to work. However, keep in mind that multiple attempts may be required with both before it does work. Before going through the step above, you may also have to add your credit card information to your Google account. You won’t get charged and this is likely required to verify your country of residence. Doing this seems to do the trick for most users. There are some issues that users have come across where the generic fixes don’t seem to work at all, and the only option left is to wait for an official update for the Google Play Music app. Music will not sync to the phone – Quite a few users have found that music that has been uploaded to Google Play Music from a computer does not sync with the phone. Standard fixes like clearing the app cache, refreshing the library, and checking sync settings haven’t done the trick. Cannot use Google Play Music and Youtube Red at the same time – Users have found that when using the same account, they cannot use Google Play Music and Youtube Red, even on different devices, at the same time. The official word is that there is a streaming limit, and that users can only stream from one service at a time. The only option here is to continue to send feedback to Google and hopefully this is something that will be addressed in the future. Chromecast issues – While there have been multiple updates to address casting issues, some users are still facing problems when it comes to using Google Play Music with Chromecast. “Browse Channel” option not working – Some users have found that the “browse channel” feature is no longer available on their app. This issue is particularly prevalent in regions outside the U.S. Apparently, Google decided to remove this feature in different countries based on low usage. Some users have been able to get it back by submitting a ticket but many are still waiting for an official update to bring this feature back. Getting the “playback paused because you are listening on another device” message – This is becoming one of the more common Google Play Music problems that users are coming across. Despite having a GPM family plan and using different accounts, when one user on the family plan starts listening to music on another device, the primary user gets the error message above. 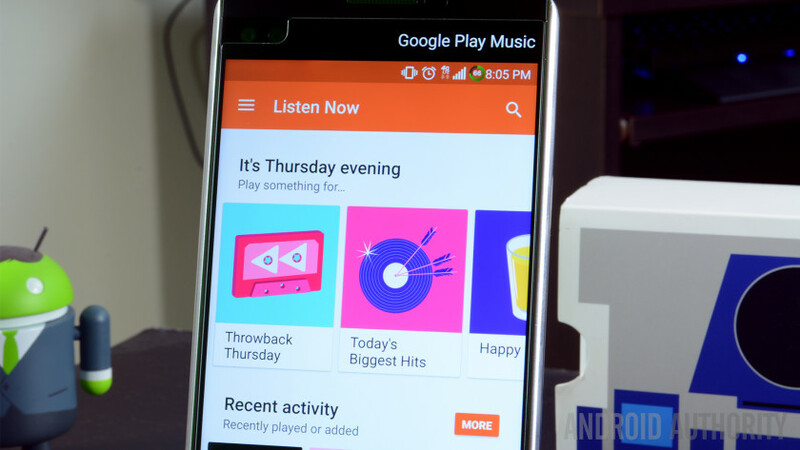 So, there you have it for this roundup of some common issues faced by Google Play Music users, and potential solutions and workarounds to address them. If you have come across any other problems, do let us know in the comments section below, and we’ll try our best to find a fix for you. Don’t let this small list of problems deter you from taking full advantage of Google Play Music. Most of these issues have simple workarounds, and given that it is a Google app, you can expect regular software updates that will continue to improve the experience.